Bose Frames combine headphones, sunglasses and... augmented reality? Bose is making the first pair of smart sunglasses that focus, as you might expect, on audio. They’re called the Bose Frames, and while its open-ear design will surprise you, that’s actually the least shocking part of the announcement. The most surprising part is that the Frames are the first component of the Bose audio AR platform, which offers an alternative to the visual AR systems like Google Glass and Microsoft HoloLens. 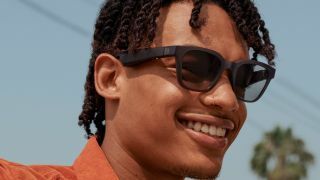 On paper, that sounds awfully intriguing — these smart sunglasses could give you a guided museum tour, for example, or help you navigate a new city with step-by-step directions without pulling out your phone, or provide information at the tap of a button. The possibilities for integration are endless and, depending on how it’s used, frightening. As for the hard details that we know right now, Bose plans to release the Frames in two styles — one that’s larger (Alto) and one that’s smaller (Rondo) — which function like regular sunglasses by blocking out 99% of UVA/UVB rays. The lenses will be scratch- and shatter-resistant, and weigh a mere 45 grams. Bose claims that the built-in lithium battery lasts for up to three and a half hours of active use on a single charge, and up to 12 hours on standby. The Frames use an included pogo-pin cable for charging. The audio drivers are located inside the arms of the sunglasses that Bose claims will "produce discreet, jaw-dropping sound for the user, and no one else". Finally, the Frames will be equipped with both a mini microphone and an assistant button that will allow you to summon Siri or Google Assistant. While Bose won't unveil more about its AR platform until SXSW 2019 that takes place March 8 through March 17 in Austin, Texas, the headphones are due out in January 2019 and are expected to cost $199 (around £150, AU$270).